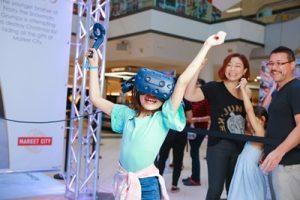 Sydney shopaholics and gamers alike will be able to enjoy an amazing festive season at Market City this year, with the launch of an all new, custom-built virtual reality (VR) gaming experience from 23 November, and up to $30,000 in prizes up for grabs. Located on the first floor of Market City, Candy Cane Fight VR reimagines the retail hub to scale, connecting the real world to the virtual world. It will see gamers step into a VR winter wonderland, where Frosty the Snowman’s younger brother, Grumpy, is attempting to destroy Christmas in the ultimate showdown. Visitors will be able to play for free and are tasked with defeating the 10-foot snowman to ultimately save Christmas for children around the world across three levels of gameplay. Prizes from retailers including Playtime, Dangerfield, Review, 1001 Optical, Chatime, Skechers, OSIM, Crumpler and Market City’s 1909 Dining Precinctwill be awarded daily, with the top scorer taking home the ultimate Santa sack, worth $1,500, which includes tech gear from Capitol Computers, Asus and Cool Master; as well as retail vouchers from leading Market City stores and dining venues, among other prizes. Market City Centre Manager, David Yam, said he is thrilled to be launching the VR game and delivering an exciting new experience for guests to enjoy in centre. “Market City is renowned for its diverse retail and dining offering, but also as a centre that experiments with innovation. 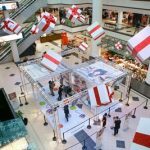 Building on our previous augmented reality (AR) activation and the successful execution of Australia’s largest snow globe activation, bringing virtual reality into the fold enables us to continually deliver first-class entertainment to local and international shoppers. 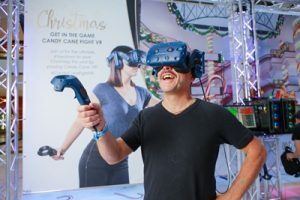 Candy Cane Fight VR is a three-minute immersive virtual reality gaming experience designed for ages eight and upwards, with four people able to play simultaneously from 11:30am to 5:30pm daily, from 23 November until 26 December. Market City is one of Sydney’s retail hubs, open 365 days a year and housing over 100 leading retail brands, specialist stores, Chinatown’s most authentic Asian eateries and Paddy’s Markets, making the iconic venue a truly unique shopping destination for all your Christmas gifts and celebrations. To play Candy Cane Fight VR, head into Market City from Friday 23 November or find out more information about the game and the prizes involved, via the Market City website www.marketcity.com.au . To join the conversation, visit Facebook, Instagram or We Chat #MarketCity #CandyCaneFightVR.